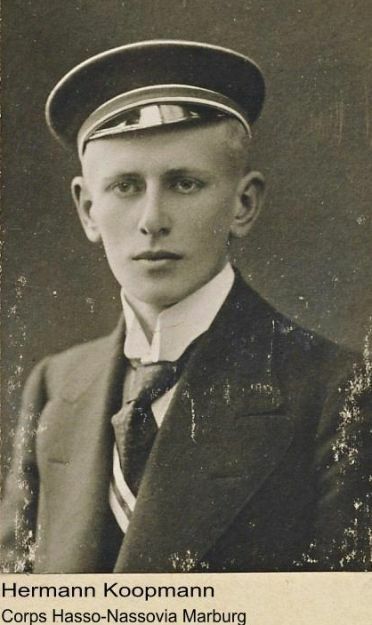 At the outbreak of hostilities, the early German youth movement did not hesitate to wholeheartedly embrace the Empire's entry into the conflict. War was viewed as highly idealized combat and struggle in battle as natural and organic need. Thousands of German university and technical college students volunteered enthusiastically for the army. Poorly prepared they were sent into action after less than seven weeks of training – much of it from elderly Officers of the Reserve who had little idea of the killing power of modern artillery and machine-guns. Instead of being divided up and sent to different units, almost all these volunteers and other reservists went to make up the numbers in the hastily reformed German fourth army. 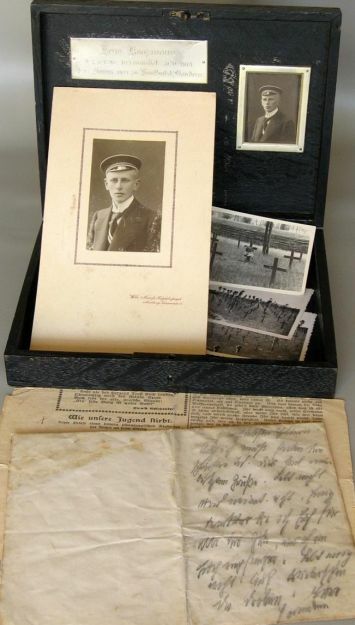 Hermann Koopmann, a 21 years old “Kriegsfreiwilliger” and law student at Marburg University found himself on the road to Flanders Fields along with his fraternity brothers(*) and classmates to experience their baptism of fire as soldiers of XXVI. Reserve Corps. Today begins with great joy. 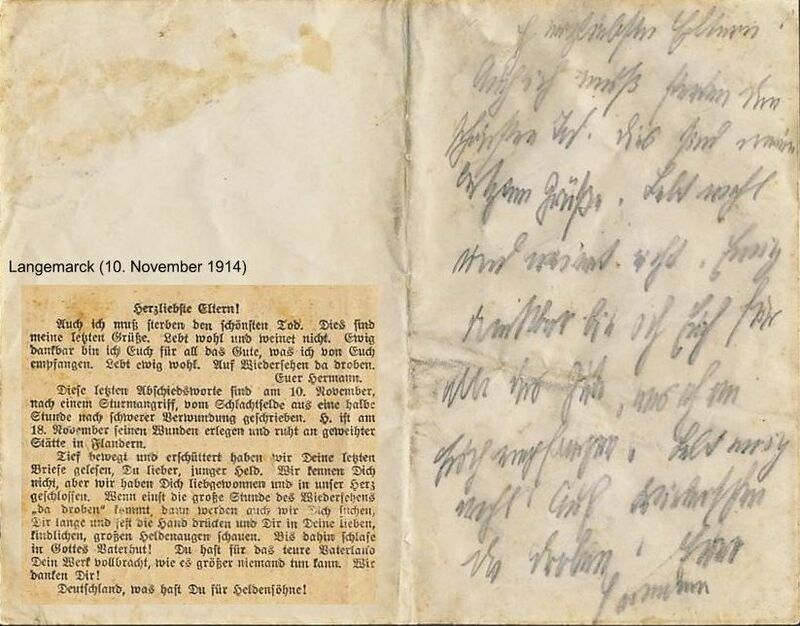 The dear letters of father, mother and Erwin from the 17th to the 19th of October arrived, and in addition to that, a care parcel sent by mother came into my hands. Thank you very much, dear parents. I have already read the letters once, but I will peruse them several times again today and in the following days. I must shamefully confess that I have not written yet to dear M. G. who delighted me by sending some chocolate. At the same time four newspapers arrived, among them one from the 29th and 30th of October. Thank God, now I have got something to do again. Yesterday it was no longer pleasant. Now you can see bright faces everywhere and people indulging in chocolate and other things. Do not send any more tins and rags to swaddle my shoes, rather send sweets and sausages. Last night everybody received hot soup, half a loaf of bread and a small piece of bacon. We can really be satisfied with that. If nothing unexpected happens, I will right away snuggle up in my hole, write a letter to M. G. and then read the “news for town and village” while enjoying chocolate and peppermint. I also found H’s postcard. Until now he has not been through much. I really believe that the artillery is much better off. I am healthy as can be. Farewell and thank you very much and best wishes. These last farewell greetings dated the 10th of November were written from the battlefield half an hour after an assault in which H. was gravely wounded. H. succumbed to his wounds on the 18th of November and lies buried in consecrated ground in Flanders. Deeply moved and shaken we read your last letters, dear, young hero. We did not know you, but we have grown fond of you and let you into our heart. When one day the great hour of reunion in heaven draws near, we will also look out for you, press your hand firmly and persistently and look into your dear, big, childlike, heroic eyes. Until then, sleep protected by God’s care! You have done your duty for our dear Fatherland, and nobody could have achieved a greater feat. We thank you! 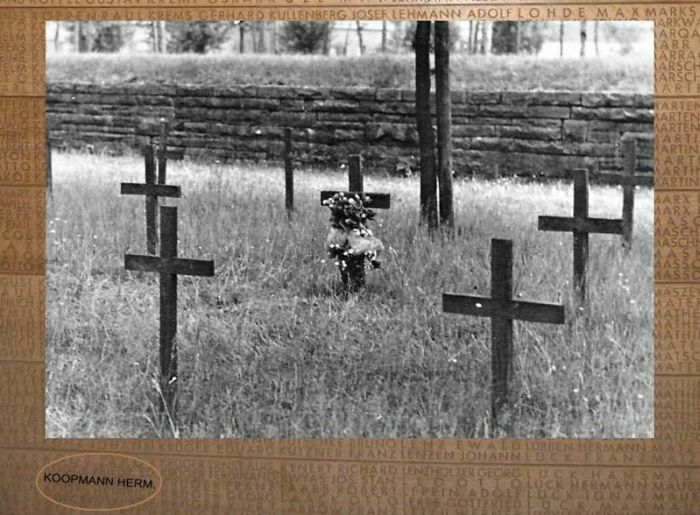 While on their way to Paris to attend a congress in August 1928, a group of students and war veterans visited Langemarck and found German graves scattered all over and overgrown with weeds. Remembering the words “A PEOPLE THAT DOES NOT HONOR THEIR DEAD IS NOT WORTH THEIR SACRIFICE”, they resolved with the help of the German war grave committee to build an appropriate cemetery. After four years of construction, it was finally opened on July 10th 1932. On the occasion, one observer wrote; “The earth of Flanders which drank the blood of the German youth has once again become holy ground”. The entrance building has a chapel-like room with oak panels inscribed with the known 6313 names of the 10,143 soldiers who were originally buried in the lower part of the cemetery, Hermann’s grave was formerly marked by a wooden cross. On each side of this mass grave are hundreds of flat stone markers above the graves of yet more soldiers, each slab bears the names of several men (the original black wooden crosses have been replaced with stone slabs). There is an additional 19,000 German soldiers resting here under the oak trees. At the rear of the cemetery is a sculpture of four mourning figures by Professor Emil Krieger, the group was added in 1956 and is said to stand guard over the fallen. Hermann’s grave is located at the burial plot A/3936. 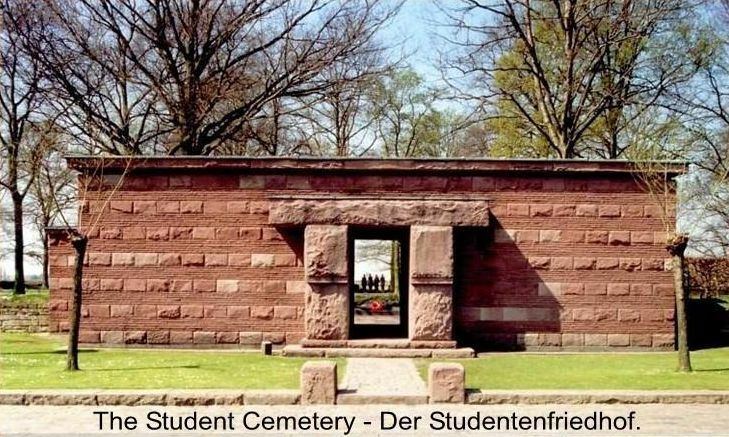 About 3,000 of the graves at Langemarck are those of the Student Volunteers who died in October and November 1914 and as a result of this, the cemetery became known as the Student Cemetery - Der Studentenfriedhof. A cenotaph was kept by the family in remembrance of the fallen son. A sombre wooden chest was designed to preserve some of the memorabilia, it is ornamented with a nameplate just above a silver plaque engraved with Hermann’s last written words. The voices of over 2,000 unfortunate souls were silenced on that tragic day and are now confined within a sole battlefield artefact; a quiet message to the living, still vibrant with emotions after nearly 100 years. This can be seen in the first picture.